So now you have done everything you know to forestall the dreaded stator failure. Chances are, however, that it will fail eventually. When it does happen to your Turbo, early warning is your last defense. This is provided by installing a voltmeter which you can monitor as you ride. I have installed on all of my bikes the battery level meter built by Visual Instruments Company (formerly Flight Products International). Of the four voltage indicators of which I am familiar for bikes, this is the best in terms of size, value, quality, and in the manner in which it presents the voltage information to the user. It is available from: CXTC's Parts and Accessories, Inc. The meter measures just under 2x3x1/2 inch deep. Voltage information is displayed on a multi-color LED bar graph. The first three LED's are red, the next four are yellow, and the remaining three are green. The faceplate is printed with voltages which are ascribed to their corresponding LED's. I do not even pay attention to the actual values, since the multi-color display makes interpretation at a quick glance simple. The unit is completely waterproof and can be mounted horizontally or vertically. It comes with faceplates for accommodating either configuration. On my Turbos I mounted the meter horizontally, centered on the fuse cover right below the boost gauge. Positioned here, it appears in place with the Fuel System light and Boost gauge, looks relatively unobtrusive, yet is centered in your sight. Also, when we turn the key on our Turbo's, what is the first thing we look at? The Fuel System light, right? Add now a voltage meter to your quick visual check. I mounted my meter to the narrow flat strip of the cover which has the word "FUSE" molded into it. To mount the meter to the fuse cover, you will need to drill two holes to accommodate the very small wires and one small screw. The meter has two screw holes positioned diagonally. I used only the lower hole, which raises the meter up but not so much that it obstructs any of the other instruments. Since only one screw is being used, tighten firmly with a lock nut at the rear, but do not, I repeat, DO NOT use any liquid thread locking agent on the threads!!! Should even the most minute amount of this liquid seep from the threads and come into contact with the plastic fuse cover, the locking agent will react with the plastic. This will cause it to shatter severely, rendering it useless and ruined, and sending you to the Honda shop to order a replacement. I know this from experience. Now all that is necessary is to tap into a 12-volt and ground wire. I learned from experience that I made an error in my earlier technical article regarding placement of the positive wire. Not a serious error, mind you, but a better method exists. I stated that one should splice the positive lead of the voltmeter to a lamp wire in the instrument cluster, instead of simply placing the positive wire under the headlamp fuse. In practice, I have now found the opposite to be true. When on a recent trip I fried the stator on the CX650 Turbo I purchased with 16,000 miles - after putting only 1,000 miles on it myself - my reaction, and the proper course of action, was to immediately pull the fuses for headlamp and taillight to conserve energy for the mad dash thirty miles home. Unfortunately, the instrument panel lights are serviced by the same fuse as the taillight, although the cover does not state this. So, if you connect the positive meter lead to the instrument lights, when you pull the taillight fuse you lose your ability to monitor the state of charge remaining for your mad dash home. Better and simpler to place a small pigtail from the voltmeter lead underneath the upstream (battery) end of the headlamp fuse. Then, all you do after removing the taillight fuse is to slide the headlamp fuse down in its clamp a quarter inch, disconnecting the headlamp from the circuit, but still allowing the meter to get its open circuit voltage from the battery end of the fuse. I have found that a good ground point is under the nut which attaches the upper headlight support to the frame. After sanding the metal surface around the bolt hole and applying a small amount of dielectric grease, fasten the negative wire of the meter to this point via a crimp ring tongue connector and tighten the nut. In the interest of easing future access to the area, cut the two meter wires about three inches from the meter and install insulated bullet connectors for simple disconnection. So now you have your early warning system. 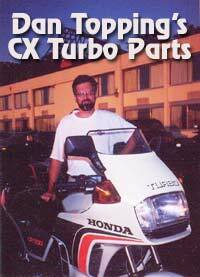 I know it works because in Florida, traveling 3,000 miles from my home in California, I fired my (normally aspirated) CX500D up one morning to discover that only about half of the normally illuminated LED's were functioning. It is worth noting that a trip is not necessarily doomed should your stator burn out, IF you have the early warning in the form of a hard-wired voltmeter. Even though one leg of the stator was shorted to ground, noticing the voltage drop quickly and removing fuses reduced current consumption enough to bring system voltage clear back up to 13 volts for - in the California burn out incident - the entire trip home. The stator in my CX500D - during the Florida burn out incident - was also shorted in one leg. There again, not only did removing the fuses bring the system voltage clear back up to normal and remain there the entire 250-mile trip back to my friend's house, there is nothing to indicate I could not have ridden that bike all the way back to California in the daylight, if necessary. Stators very often - and in my two experiences - do not fail completely. Quit worrying: Get the meter. Pull the fuses. Ride home. OK. So what if your stator fried, and the battery voltage keeps sinking abysmally lower even after removing the fuses? Well, first of all, soon your bike will become very quiet and very still! Seriously, even if the voltage keeps sinking, leave the fuses disconnected. This buys you more of your most precious resource: TIME. If you are less than about fifty miles from home, you caught the emergency early, and your battery was strong to begin with, you buy perhaps enough battery time to get your bike either home or to a shop before it dies suddenly. If your stator fails much further from home and you do not want to be stranded when your tiny fourteen ampere-hour battery gives up the ghost, head straight for the nearest store which sells automobile batteries. With one of these babies strapped to the rear of your seat, wires spliced into your bike's positive and negative battery cables, and your fuses removed, you can travel all day before that monster battery quits on you! Need to go further than that? Once your voltage starts getting too low again, swing by a service station for a quick-charge and be on your way again! Inconvenient, but not as much as a tow, massive repair bill, and an unscheduled layover of unknown duration while far from home. It is always easier to deal with such trauma if only you can sleep in your own bed at night!